No doubt, Dalek has transfered the main energy to the bottom. But there is no evidence to show the flashlight can kill Doctor Who sitting in TARDIS. Well, let’s go on checking the Dalek keychain. 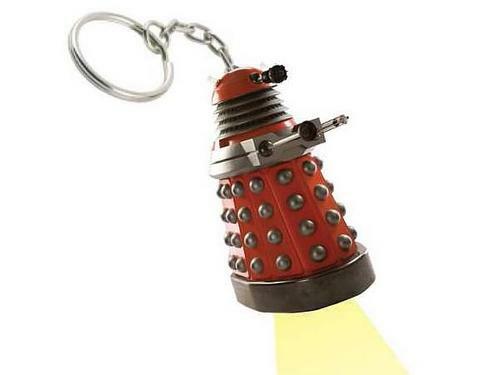 This is one of Doctor Who themed keychains. Another is Doctor Who’s TARDIS. Unlike the TARDIS keychain, the Dalek isn’t used to hold your change, but the built-in flashlight can help you drive darkness. So you need 3 LR41 button cell batteries to power your powerful Dalek. Apart from that, the Dalek replica measures 2.5 inches tall. The key ring on the top of the dome lets you attach keys to the Dalek keychain.